Writing your about page is usually treated as an after-thought. A place to stick your education history, that award you won in 2004 and talk about your favourite pizza toppings. If this sounds like you, then you seriously need to look at your about page again. In many cases, an about page is a highly trafficked page on your website. Sometimes, it’s the second most popular page after your homepage. If you haven’t thought carefully about your about page, and how you’ll build trust and increase conversions, then you could seriously be missing out on leads and sales. 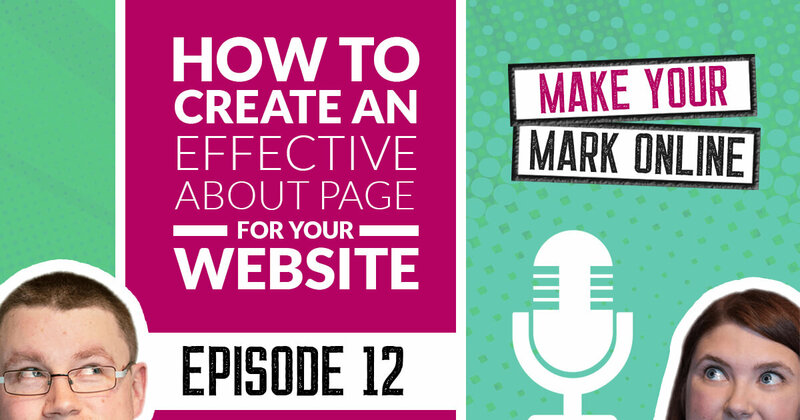 In this podcast episode, we go through the ways you can create an effective about page for your business. What is the most common mistake people make on their homepage? 2.17 – What do people do wrong on their about page? 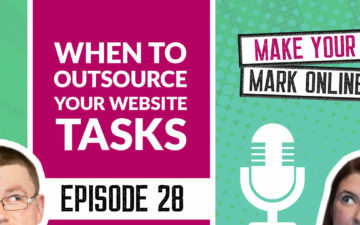 Welcome to the Make Your Mark online podcast where we help personal brands build and grow a successful business website. Please welcome your hosts, husband and wife team Martin and Lyndsay. We’ll only be opening the door for two weeks. That is the lowest ever price. Two weeks, not long, so please check it out. So let’s get into the show. So, yeah, the About page. 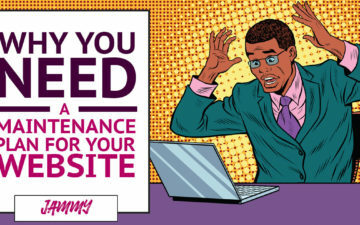 It’s actually a really, really important page on your website, isn’t it? It is, yeah, and I think a lot of people don’t actually realize how important an About page actually is. It’s a really heavily trafficked page in many cases. Sometimes we’ve seen it’s actually the second most popular page on a website with our clients. Well I think if someone wants to find out more about your products and services, they just go to your About page. It’s sort of been there since the home page, really, since the dawn of the internet. So I think it is a really popular page. Often people kind of treat it as an afterthought or they don’t really put much effort into it or they do put a lot of effort into it, and they kind of get it a bit wrong, because you really want to take advantage of your About page. Because it’s so popular and people really go to it quite often, you want to make sure that you use your About page to your advantage and actually kind of think about increasing conversions on your About page and getting people to really connect with you. Okay, so you mentioned that people sometimes do it wrong. What are the things that people are doing that are probably not working well enough? Well, it’s quite often we see this, and you might do it yourself. They’re kind of like, hi, my name is Bob and I graduated university in 1987 with a 2:1 in Engineering which has nothing to do with what I’m doing now and has zero interest to you and oh no, you’ve gone. Bye. Yeah, I think a lot of people do that, and I totally understand why. You automatically think About page, that’s about me and what I do and what I think and what my experience is. Sometimes you get a real life story, don’t you, when you were born, where you were born, where you went to university and that’s very easy to write because you know you and your life very well, but it’s not great at sort of connecting with your reader. So I think that’s the biggest mistake that people actually make and it’s really easy to fix, to be honest. Okay, so that’s how not to write an About page. So what can we start doing to improve our About pages and how do we actually write them? Well, the easiest tip I give, well actually it’s Martin’s tip that I’ve just stolen. I’m a thief of Martin’s tips, is when you come to write your About page, instead of About at the top of the page, put About how I can help you, and this will really reframe your mind when you come to write your about page and sort of think of it from your audience’s perspective rather than your perspective. It’s kind of like flipping it on its head, really and talking about how you can help your potential customers and your readers and doing it that way. So we’re not talking about actually using that as your title for your About page, we’re just talking about while you’re creating the About page, actually call it About how I can help or About how we can help you, that kind of thing. Absolutely. Yeah. Although, I have actually seen a few, a very small number of people do put About how I can help you, but yes, this is just for the purposes for you when you go to write your About page. Okay, so how do we lead into the About page because starting these pages is always more difficult. It is, yeah. I think starting any new piece of writing, new piece of content even though I do a lot of writing, the start is always the trickiest part. You just kind of have to figure out a way to get into it. And I find the best way to start an About page is just reaffirming to your reader that they’re in the right place. It’s a really, really easy thing to do. It’s a really easy tactic. You could say something like, are you looking for whatever it is? Then you’re in the right place. If you need a whatever you offer? Then you’re in the right place. It’s just reaffirming to the audience that they’re in the right place, making them feel secure, making them feel like, okay, this website and the content is for me. That’s great. Okay. So rather than say, we’ve been running this giftware business for 20 years, it’s more about, I use [inaudible 00:05:09] to decorate your child’s nursery, for instance. Are you looking for lots of Star Wars things to put on the wall? I don’t know where Martin got that from. No, completely out of the blue. Completely out of the blue. But that’s what you’re saying. You’re talking about actually empathizing with their potential problems or what they’re searching for, and actually giving that information to them straight away rather than making them find it through the boring corporate information about how you started and how long you’ve been going. Yeah. Exactly, exactly. It’s about, just sort of, you can talk about what makes you unique in that sentence. So if you’re a gift website you could say, are you looking for a gift that isn’t the typical flowers and chocolates? Then you’re in the right place. That type of thing. It doesn’t need that much thought to be honest. You just kind of are reaffirming to people and getting them to nod their heads and go, yeah, that’s great. Okay, I can continue reading type of thing. Yeah. And it’s a good way to sort of really get into the About page, because as we said, starting off these pages feels like an impossible task sometimes. That’s a really, really easy way of doing it. Yeah, so this is the sort of thing we did on our About page when we went live with a new website in February. Yeah, actually, we were one of the sort of naughty people to begin with who just talked about ourselves on our About page probably about five years ago. And yes, we sort of reframed it with our latest website update. We say, if you’re looking for a web designer who gets your business, who isn’t afraid to say what works and what doesn’t, then you’re in the right place. And it’s quite a simple sentence that we use. I didn’t put too much thought into it, but one thing I did want people to understand is that they’re in the right place if that’s what they’re looking for, if they’re looking for a web designer who’s quite honest with them, but equally if someone thinks, I’m looking for a web designer I kind of just want to boss around. I’m looking for a yes man or a yes woman and they come to our About page, they automatically know that we’re not for them. And that helps us because then they don’t get in contact with us and waste our time, but it also helps them because we’re not going to waste their time equally, It’s a good method to think about who your ideal clients are and who they’re not. We talked about this on the last couple of episodes of the podcast. Yeah, episode 10, I think it was. Yes, yeah, and just really thinking about that and actually highlighting that in the first sort of sentence makes people either think yes, that’s definitely me or think no, these guys aren’t for me and just leave, because ultimately you don’t want to be dealing with people you don’t want to be dealing with, do you? Yeah, and it’s a very quick, it’s so much quicker actually talking about the who you are and who you are not on your About page because it’s just so easy. People click on the About page to work out whether they actually want to work with you, maybe find out a little bit more information, and it’s a good opportunity to actually use as a filter really. So once we’ve done that, what else can we do? How can we use the About page maybe to connect to the reader a little bit more? Yeah, so we need to talk about how we can help out potential customers or clients, and the way to do this is to think about the problems that they’re having. Now this is something that we actually got off someone called Marcus Sheridan who we spoke about before. He is a legend, and also Chris Marr who also teaches this as well. I will put them in the notes. I think they are in our notes on every podcast episode. I think they would be insulted if we didn’t link to them in every episode, really. I know. So yeah, this is something that we’ve actually learned from them and talking about the problems that your potential customers and clients are facing and how you help solve them. Now what Marcus’ advice is, is to have that on a Problems we solve page. We actually find that this also works quite well on an About page as well because your customers are already kind of there, your potential customers are already kind of there. They’re trying to figure out if you’re right for them. So the About page is the perfect page to put this on and it’s really about talking about, okay. I understand your problems. I know they’re an issue. Here’s how I can help. Here’s the service that I offer which helps, and talking about that on your About page works really, really well. Yeah, because everybody knows well, when we get inquiries, we get inquiries like I’m struggling with traffic. I’m not getting enough traffic. I need a new website. Or, my website’s really old and we need a new website because it needs to be more reflect our business. We know these problems because we have conversations about them every single day. Yeah, exactly, exactly. I mean if you just listen to your customers and clients and hear what they say in terms of the problems they’re facing, they will tell you. Often it will be the first thing they say to you in their email or when they call you up. Look, I’m having a nightmare with this, or I want this to change or whatever it may be. You can easily figure out what the problems are that your customers are having. So it’s very easy to put that on your About page, definitely. So when it comes to layout then, how do we structure this on our About page? So we understand the problems you solve and it’s important, but how do, what’s the best way to make it look good? Yeah, it’s different actually, because people often say to me, well how do I actually word this? How do I get this into words and paragraphs? And we do it quite explicitly on our website and our About page. We just list the problems that people are having sort of in an FAQ style sort of section on our About page. We kind of list the problems. We have four main services. So one of the services is web design, so we list the problems people are having in terms of web design. So are you having a lack of traffic? Okay, this is how we can help. We build websites in a certain way, blah, blah, blah that will increase your traffic blah, blah, blah. Are you having a lack of conversions? That’s rubbish, it’s great getting loads of traffic to your website but a lack of conversions is really not good. We’ll make you a conversion friendly website and etc. So you kind of, you’re talking about, you’re acknowledging the problems that they’re having, you’re sympathizing with them, and then you’re saying how you can help and it’s very, very, very explicit the way we do it on our About page. There’s many different ways you can do it, but that’s probably the easiest way to actually do it. Yeah, and it’s actually really interesting because how nice would it be for you to go to a page on a website and say, and just see in black and white, you’re having these problems, and we know that you are, and this is how we can help. It’s just so simple I don’t know why more people don’t do it. The About page makes it so easy for you to include this. Again, it’s just so easy and I think that the way we’ve designed it, it makes it less kind of text heavy, which is always a good idea, I think. Yeah, definitely, that’s a really good point, actually, because we’ve seen About pages that look like War and Peace and you’re kind of waiting for a paragraph for some air to breathe. This is a good way of doing it in nice little bullet points. Just give it some space on the About page, most definitely, very easily digestible information that people can use. It’s also a good opportunity to, once you’ve highlighted what the problems are that they’re facing, how you solve that problem, it’s a real opportunity then to get them to that particular page. 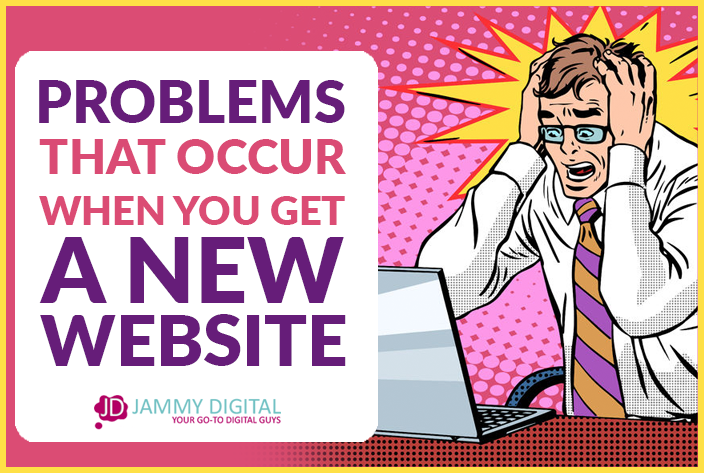 So say on our web design, when we’re talking about, okay you see a lack of traffic or a lack of conversions, here’s how we can help, visit our web design or website redesign page, or whatever it might be. You are kind of directing people to the page that you want them to go to. Then they can learn more about that particular service. So it’s a great place to have your call to action, to really get people to the places where you want them to go and hopefully take action with you from there. Okay, so that’s really interesting because I don’t think anybody or many people will have thought about an About page as a kind of sales tool, but it is. Exactly. It is. It is. And this is what we always say to people. You need to take advantage of this page. Don’t talk about your engineering degree that has nothing to do with what you’re doing now. It’s boring. This is a page where you need to kind of think, okay, what are my audience after? How do I connect with them? How do I get them to move onto the next page to sort of build trust with them so they eventually get in touch? That’s all your About page is for, really. Okay, so we’ve spoke quite a lot about using your website to empathize and to be able to touch on the problems of people and then converting them. But we should have some personality on the About page, shouldn’t we? Yeah, absolutely. That’s a really good point. I think, from the people I’ve seen this do this well on their About page where they empathize and talk about the problems and things like that, one of the common mistakes I do see sometimes that people make is they lack personality because they’re so focused on their audience and that’s absolutely right. If there’s a choice between all about you and all about your audience, I’d say go for all about your audience, but you have to find that balance. The About page is a great page to show some personality, to show who you are as well. Don’t be afraid to do that on your About page. I’m not saying you have to do it in the first sentence as we’ve said, but it needs to be in there somewhere. A great way of doing this is including pictures of you and your team, obviously so they can see your face. If you haven’t got your face on your website, get your face on your website. Don’t be afraid, because people want to connect with you and the way to do that is showing who you are and who your team is. And another way is actually to talk about yourself as well. We have parts about ourselves on our About page. We talk about our cats and Star Wars and Harry Potter and all those kinds of things. It doesn’t take up a lot of the page. It’s probably couple of paragraphs, but people need that information. They want to know who they’re dealing with, so don’t be afraid to also include that as well. Just make it quite succinct. Make sure it shows personality as well through your writing. We’ve actually covered this on another podcast episode which was tone of voice. I’m not sure which one that was, but I’ll put it in the show notes. Don’t forget that as well. You don’t want to be kind of a robot. You do have to show personality as well. Okay, so what else can we put on our About page then? What can we do to really kind of tie it all together really and start thinking about finishing it off? So after that, after all of that, which is a lot to do, sort of reaffirming someone’s in the right place, talking about the problems that you solve, talking about yourself and having a bit of personality, it’s again thinking about, okay, well what will build trust now? What will make people connect with me? Having some testimonials on there from your clients and things like that having them patch your portfolio or something like that. I’m not talking about making it too long, so don’t stuff everything in there, but at least have something that gets people to other pages to explore all the parts of your website, and to also build trust as well. So I definitely recommend having testimonials on your About page if you can. Yeah, we definitely wanted to make an effort to include a couple of results that our clients have got and we put that quite small, but we do include it. We’ve got a quote of a couple of people. One thing we haven’t done which is actually a great place for you to put this is if you’d won any awards, then you might want to use this opportunity to maybe have a section that talks about your most prestigious awards. We don’t really talk about shouting about your achievements as an organization that much, but this is the opportunity where you can actually have a section where you say, well we won the best blogging award this year at Content Marketing Academy. Yeah, we did. We actually should go back and add that in, but again, if you’re struggling to think about where to put things like that then you can put them on the About page. It all helps build trust and credibility and things like galleries, that helps as well. You could, potentially, write a lot for your About page, but you don’t have to include it all. You could just include some of the things that we’re talking about. Yeah, definitely. I think our About page is probably a couple of thousand words, and we’ve seen About pages that are about 300 words and you don’t want to give people too much, but the way you design as well, you’re breaking it up as we talked about. The problems you solve, the bullet point lists, there are things you can do to sort of break up the text particularly on your About page so it doesn’t look like War and Peace. So yeah, definitely think about that as well. Things like testimonials as well and things that really break up the page and make it a little less text heavy certainly. Okay. Perfect, so hopefully you’ve got a lot of information from this episode that you can go out and action straight away. Just make sure that if you are including a lot of information like Lyndsay said you’re using some visual aspects to break up the content a little bit ad that should help. It’s all about building trust. And the thing is when somebody visits your About page, they do actually want to find out a little bit about you. So don’t think that you can’t include this, but you should be thinking about sales and conversions first, whilst also including some information about yourself. That big transition changed everything for us. We say to every client that we’ve ever built a website for, be careful of having too much information about you too soon because people won’t have any reason to read on. Yeah, exactly, it’s just all about connecting with your reader and making them feel comfortable with dealing with you and actually building trust with them. That’s essentially what the About page should be about, definitely. So that we can then convert them into customers and [crosstalk 00:19:00] . Wonderful. It all works out in the end. Perfect. So really great episode. If you have any questions or you want to leave us a review, then visit our iTunes page at jammydigital.com/iTunes. Tell us what you’d like to see in future episodes, but the big news this week is that our membership community is launching on the first of October and we’re very, very excited. If you are listening, shortly after this podcast has been released, then you should be able to at least join the wait list or join up, but we’re only opening it up for two weeks, the lowest ever price. It’s $29 a month. I mean, that’s nothing. $29 plus VAT, I should say. Yes, if you are a UK or EU business. So yeah, it’s really exciting. We’re very, very excited about it. In our next episode, actually, we are going to be answering some of the questions we’ve been getting about the membership as well, so if you are interested, and you’ve not got much time to contact us then, make sure you’re listening to the next episode where we actually answer some of those questions and potentially some of those concerns that you might have about joining another membership community. So, we’re really excited about that and if you want to join, go to jammydigital.com/wait/ or you can just go to the same page and it will redirect you to the brand new sales page that we created, so that’s exciting as well. But yeah, we’ve already got lots of people interested, so it will be nice to have you as part of the community as well. Yeah, definitely. And the thing we’re looking forward to is those first two weeks when we get that those first founding members, isn’t it really? And we’re going to be able to work with them quite closely because we’re going to close off after two weeks. Get your membership so those members will be our founding little babies. 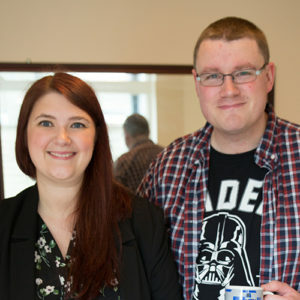 We’ll be able to work with them closely, helping them build a great website and a great business. So, yeah, it’s really, really exciting. So we’re really, really looking forward to it. Fantastic. So we will see you in the next episode of the Make Your Mark Online podcast. Thank you – love the way you have broken down the topics so that people can focus on one area at a time. It can be overwhelming otherwise! Looks like I have another page on our website to return to and review/rewrite!